The issue of coal has been in the news a lot lately. On Wednesday an Iowa utility agreed to stop burning coal five of its Iowa plants. The pants will either shut down or switch from coal to natural gas. This is due to a legal settlement with the federal Environmental Protection Agency. The government says this will make 200 coal-burning plants that have shut down in the past five years. Getting away from coal would mean less pollution, less black-lung disease and a lot fewer mining disasters. Coal-mining songs are a staple of American folk and country music for decades. Coal might be dirty and awful. But come on, can you truthfully imagine a song as powerful as "Dark as a Dungeon" or even "Big Bad John" coming out of a solar plant? Back in 2008, I reviewed country singer Kathy Mattea's excellent album Coal, which featured several classic coal-mining songs, including some written by folksingers Jean Ritchie and Hazel Dickens. For my money, "Dark as a Dungeon" written by Merle Travis is the greatest song about coal ever written. It doesn't deal with a mining disaster or black lung or labor strife. 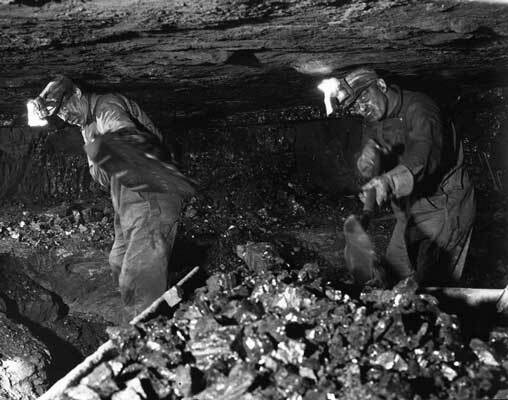 It's about the psychic effects of spending day in and day out in a "dark dreary mine." This version is performed by Travis with The Nitty Gritty Dirt Band on their landmark May The Circle Be Unbroken album. "Dream of a Miner's Child" is a terrifying little number about a coal miner who's about to leave the house to go to work when his little girl stops him and tells him about her vivid nightmare: "I dreamed that the mines were all flamin' with fire /And the workers all fought for their lives ... "
In "16 Tons," (which also was written by Merle Travis) Tennessee Ernie Ford makes coal mining seem rather cool. It doesn’t pay well, but it apparently it gives you license to kill those who refuse to step aside when they see you comin’. "Workin' in a Coal Mine." And in the '70s, Loretta Lynn took great pride in being a "Coal Miner's Daughter." In "Paradise," written in the early '70s, native Kentuckian John Prine sang of the environmental and psychic damage caused by "Mr. Peabody's coal mine." Jimmy Dean immortalized a coal miner called "Big Bad John" in this early '60s hit -- before Jimmy started working at the sausage mine. "Last Train to Poor Valley" by Norman Blake is about what happens to the workers when the mines all shut down. The main message of “Timothy” by The Buoys is that just because you’re in a mining disaster, that doesn’t mean you have to start skipping meals.